Common story: a bachelor didn’t like doing dishes– not too many do, right? So he let his dirty dishes pile up in the sink for weeks. It got pretty gross, it smelled bad, and when it came time to “deal with the dishes,” guess what he discovered? The bachelor found green and black mold growing on various plates and dishes in his pile of unwashed stuff! Yuck. 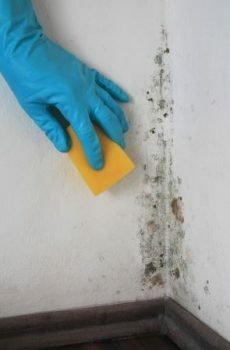 Mold: it loves to appear in your home. Homeowners, however, do not want mold to make an appearance. So what can be done to prevent mold from appearing in your home? Right now think about all the places in your home where there’s water. Some obvious areas include the bathroom and the kitchen. Also, consider that your windows get battered with rain water. Do you have any leaky ceilings with water stains? Wherever you’ve got moisture, you’re likely to get mold. Therefore, do what you can to rid areas of any pooled water. This could mean repairing gutters or throwing out old carpeting or having a plumber or HVAC guy over to fix a leak. If and when you see a wet area in your home, no matter where, if you can dry it up quickly, do so! The longer you let water linger, the worse potential mold problem you’ll have. That’s why people across the country are always quick to dry out their basements after they flood. Otherwise, they’d become “mold city” down there. How well is your home ventilated? If you have lots of aquariums with fish swimming around inside of them, chances are the air in your house is quite humid and needs to be mitigated. Dehumidifiers often do a fine job of making homes less humid. Ideally, indoor humidity should be kept between 30 and 60 percent. Even something as simple as opening a window to let humid air out of the house can help prevent mold problems. Did you know there are mold-resistant products available on the market today? Look around and you’ll discover things like mold inhibitors for paints as well as mold-resistant drywall. Should you discover a mold problem in your home, don’t hesitate to call Rapid Response Restoration at 602-466-2619 for a proper clean-up.